You can change the aspect ratio of the displayed image to resize it. Note: For HDMI sources, the input signal determines the image's aspect ratio. You can only change the Aspect setting when the input signal is HDMI. Select the Signal menu and press Enter ( ). Select Aspect and press Enter ( ). 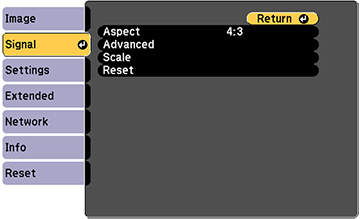 Select the aspect ratio you want to use for your input signal and press Enter ( ).